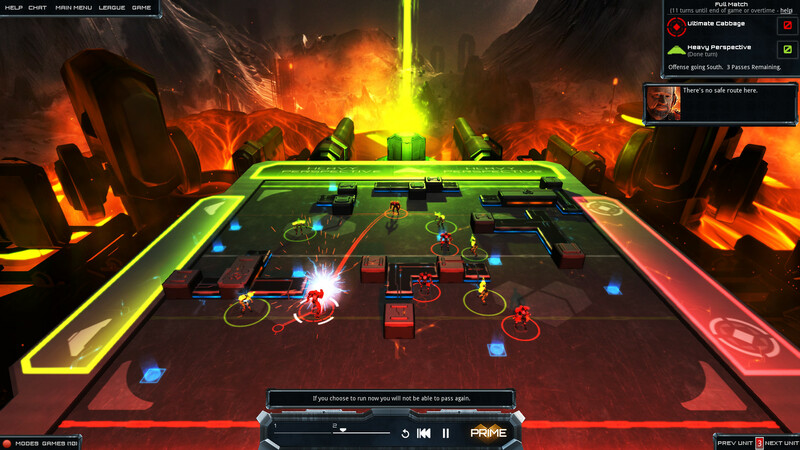 Frozen Cortex* transforms the simultaneous turn-based strategy of previous Mode 7 Games hit, Frozen Synapse, into a streamlined, non-violent futuresport between two teams of five robots with varying skills. Despite this seemingly-complicated network of lines and circles, the interface and gameplay basics of Frozen Cortex are easy to grasp and not dependent on extensive sports knowledge. ·Since turns are executed simultaneously, you’re constantly guessing what your opponent will do next, what you should do accordingly, and how to gain the upper hand. If you’re wrong that entire plan can fall apart, making the next 10 turns a desperate struggle to redeem a crippled strategy. ·Turns, when executed, last 5 seconds or end when a critical event occurs (someone’s intercepted the ball, etc.). It’s real life, focused purely on the interesting moments, and approximated in a turn-based game–or as close to real life as robots beating each other to bits on a field suspended over lava can be. ·Who to bet on for winning the next match, or whether to gamble at all. To chance your entire budget on a promising player, or several reserve players. To queue in a general strategy and have the computer simulate a match, or to play it yourself and struggle against the AI once again. Players are presented with choice after choice–each with a lasting effect. This pressure makes the game tense even off the field, and as a result difficult for me to play for long periods. ·Frozen Cortex’s fairly radical approach to time and strategy in a turn-based game creates an extremely steep difficulty curve. This is mitigated somewhat by the Easy singleplayer modes added in a recent update. These Easy modes allow you to actually see what your opponent plans to do next. You can still make mistakes and play yourself into a corner, but this addition allows you to learn valuable mechanics and tactics from the AI. ·It’s comforting to see that outside of robots hitting each other extremely hard, blood, gore and violence is nowhere to be seen. ·Players can bet on matches in both the main GCL (Global Cortex League) and College leagues. ·Rare examples of profanity can be found. ·An element of risk is present whenever you’re dealing with other players (and the customizations they’ve made to their team) online. A switch to block the viewing of another player’s customizations is present in the Options menu, which should guard against inappropriate team/stadium names, etc. This entry was posted in Uncategorized and tagged Bible, christian, christian gaming, christian review, christianity, family-friendly, Frozen Cortex, Frozen Synapse, gaming, God, indie, Mode 7 Games, non-violent, review, robot, Steam, strategy, turn-based, video game, video games, video games and the Bible, Video Games and the Bible Highlights, Video Games and the Bible Plays..., Video Games and the Bible Reviews. Bookmark the permalink.